Independent operators Dave Sugarman and Carl Curtis have pledged to follow the Cardiff City Supporters’ Club (CCSC) which announced the initiative after the Bluebirds reached the Wembley Final. The appeal committee would also like all supporters – whether they are travelling by car, train or mini bus – to make a donation of £1 each. Independent coach operator Dave Sugarman, who regularly runs buses to away games from the north Cardiff area, said: "This is a terrific initiative from the supporters' club and it should raise a lot of money for the Fred Keenor appeal. Carl Curtis, who helps to run www.cardiffcityforum.co.uk and organises coach travel for its members, said: “I am organising four coaches to Wembley, having already started collecting for the Fred Keenor Statue Fund on previous trips and will continue to do so for each away trip until the end of the season. Hopefully, we can reach the target for the fund and have the statue erected outside the Cardiff City Stadium in the not too distant future." David Craig, the appeal fund’s project manager, said: “We would like to thank CCSC for this fantastic initiative and Dave Sugarman and Carl Curtis for pledging their support. “This statue is for every Cardiff City fan and I hope other independent coach operators will follow suit. Also, we’d be delighted if those fans that travel by mini-bus, car or train will also make a £1 donation each so we can get to our target of £85,000 quickly.” Cardiff fans are expected to have around 31,000 tickets for the Carling Cup Final. 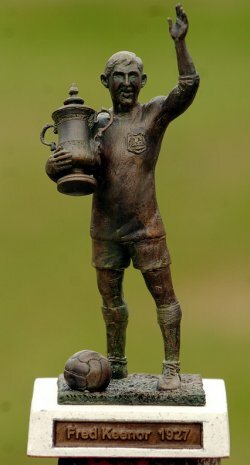 The appeal to raise a statue to Cardiff City legend Fred Keenor has reached a landmark total of £45,000.That means the appeal committee will now be able to apply for £15,000 promised by Cardiff council once invoices for the work carried out by artist Roger Andrews have been received and paid. That leaves £25,000 still to be raised. Donations can also be made at the Trust office (near Gate 5) on match days while cheques can also be sent c/o CCST to PO Box 4254, Cardiff, CF14 8FD. Please add the words “Fred Keenor Appeal” on the top of the envelope.